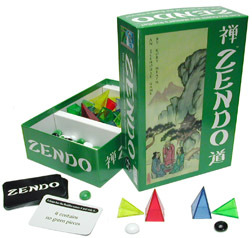 Like IceTowers and Zendo before it, Volcano will come in a cardboard box 9" x 6.25" x 2.6", with a fully-telescoping lid and full-color artwork on both the upper and lower halves of the box. We have not settled on who is printing the box, and would like to print them at the same place (or very close by) where they get assembled... so we don't have to ship large pallets of empty boxes around again. 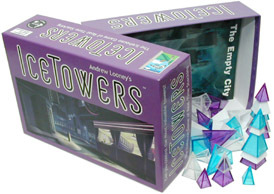 The box then gets shrink wrapped and placed in cases (ULINE #S-4838) of 6 games, with a carton sticker on the case box. If we do a large print run (as we are contemplating) we are interested in a quote on having the bulk of the print run stay stored at the place that assembles them - to be shipped as needed to our warehouse to fill smaller orders - and to our distributors directly in bulk. Please quote on assembly of just 2000 (which is what we will make if we do a small run with the existing mold) and on several much larger quantities - 10k, 20k, 30k - so we can see how much the costs come down when we make lots of them. While you are quoting on boxed set assembly, please also quote on pyramid tube assembly. Although these two tasks would not necessarily need to be done by the same person, there are advantages to only sending the pyramids over to one facility. We need to produce a new Volcano Board - one which is cheap enough not to drive the cost of this boxed set up too far, but still nice and functional enough to give everyone a handy board for playing Volcano. Injection molding would work, but the mold cost is again prohibitive - we are now looking at doing this with a vacuum form process... but we are open to suggestions. How should we make these? We want something as inexpensive as possible, but it needs to be sturdy enough to load up with pyramids and pass around the room. Also of course, it must fit into the box. We might only need 2000, if we make a first short run of the Volcano boxed set - but we could make a larger run of Volcano boards even if we only make the short run of boxed sets at first. So let's get quotes for 2k, 10k, 20k, and 30k. 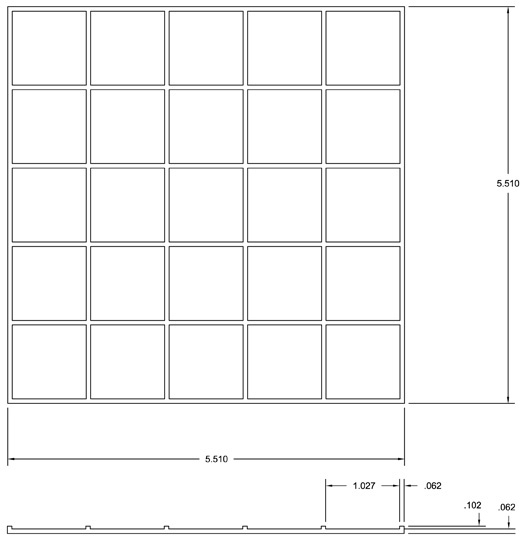 This diagram gives details - narrow ridges define 25 1" squares, each just big enough to receive a large Icehouse piece standing upright (much the way a tile fits into a deluxe Scrabble board). The ridges should maybe be slightly taller than those shown in the diagram. the product sticker, a long strip that says "Icehouse Pieces"
Finished tubes of a la carte pyramids are to be packed out in shipping cartons (ULINE #S-4315) of 36 tubes each, with a label on the outside of the box identifying the contents. 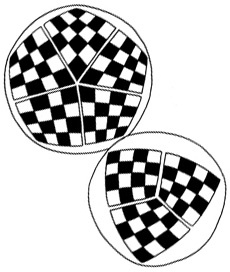 Some day we will be making a boxed Martian Chess set, which will include a round felt gameboard, with a 5 player chessboard on one side and a 3 player chessboard on the back. We will need thousands of them when we make the boxed set, so I need a quote on 2000, 5000, and 10,000 - but I would love to get a much smaller batch right now just to sell to our fans in our Short Run Depot. Could we make 100 of them? or maybe 500? 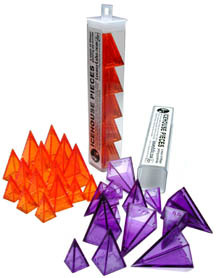 Icehouse pyramids are injection-molded crystal styrene plastic. They are made using a family mold that produces 1 of each of the 3 sizes of pyramids in a single shot. Randy Ervin, (aka KLON - a little family owned and operated plastics company in Baltimore Maryland), built this mold for us back in 1999, as seen in these photos of The Day of First Pieces, and we have been working together to solve various problems to make beautiful pyramids in the years since. The piece cost on the pyramids is killing us, and we need to get the price down. Our friends at KLON can do this for us... we just need a bigger mold. We need one that uses a Hot Runner system, so the parts just pop out ready to use - instead of the Cold Runner system of our original mold, which requires the excess runner material to be clipped off by hand. We went with this tiny family mold in the first place, since we couldn't afford more than the $10,000 we paid for that mold - and we had not yet built up any demand for the pyramids that would warrant the larger high-production molds. Time has passed, the pyramids are now in distribution and have won lots of pretty major awards. It's time to make the larger mold and get the price down... and even though we could do it all at a fraction of the cost (*) by sending the job to China, we are going to figure out a way to keep making our pyramids here in America. If we get a new mold, and make a big run, KLON can get the price per piece way down... but we need to get a new mold. We can't make our pyramids in China. There has to be a way to make these numbers work - so I need numbers. 1) the cost of three new high production molds as we have discussed. 3) the cost for a bag of 5 small pyramids, a bag of 5 medium pyramids, and a bag of 5 large pyramids, using our OLD mold. We need to get the Volcano set into production before Christmas - even if we only make a small run of 2000 of them the old way at a crazy high cost. So that's 2000 bags of each color, each size - in Red, Green, Yellow, Blue, and Orange. PLUS we would need 2000 bags of just small white pyramids. You will have to grind up the mediums and larges - we need just small white pyramids. We will work on trying to come up with the cash to pay for (1) so that we don't have to do (3) - but we need hard numbers to play with to figure out how we are going to make this pyramid thing keep happening.